Posted on February 10, 2019 by dobetteralways. This entry was posted in photography and tagged Minnesota, Pedicure, silent sunday, winter. Bookmark the permalink. Hahahaha! The touch up on my big toe never did stop being tacky, eventually when I’d been home for hours I got out my own clear top coat and that dried in a min. Score one for at home vs salon products. It was cold hopping one footed through the snow and driving home but otherwise it was more annoying then anything else. Pedicure that wouldn’t dry. 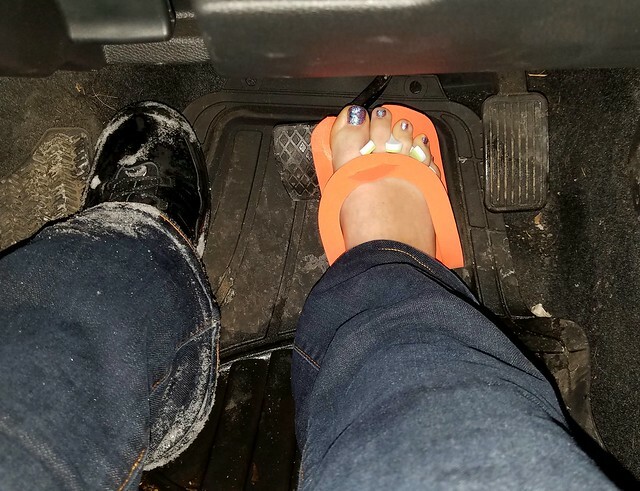 The salon tech had rubbed off half the polish on my toe checking to see if it was dry yet and had to redo it, meanwhile the place had closed right as he had finished originally so they were all just waiting for my nails to dry to go home, eventually I just figured I’d find a way to get home without putting my shoe on and hopped through the snow and drove home like that. It made me laugh. Had to put my own top coat on at home because whatever he tried to put over my nail was still tacky hours later. Supposedly that’s what they put on my toes but for some reason it just didn’t dry like it was supposed to. I sat with my toes under that light fan for 20 min.